A rich resource to understand the pros and cons of not just compressed air, but also CO2 and the simple handpull to dispense beer, is a 1926 article by James Auld entitled Raising Beer by Air Pressure. It appeared that year in the Journal of the Institute of Brewing. When we consider the hundreds of thousands of pounds spent … to achieve perfection in brewing beer, it is surprising how little attention or care is given to the beer after it has left the brewery, and in introducing this subject for your consideration I hope to suggest a more efficient system of serving the beer to the customer than has generally been adopted. A brewer can make the best beer in the world but if it is half-sour (unintentionally) when you get it, or too flat, or dirty-tasting, all is for nought. The way beer is served, and how it is handled before the glass is handed you, can vitally affect its taste – and whether you will buy it again. U.K. brewers and others interested gave anxious thought to these questions before WW II and they are no less pertinent today. The three methods of drawing beer mentioned above, compressed air, carbon dioxide dispense, and vacuum handpump, were the principal ones in Britain during the 1900s. For this purpose I exclude drawing beer straight from the barrel by a simple tap, as doing so was a rarity, relatively, even 100 years ago. But even in the 1920s charging a cask with CO2 gas from a cylinder to impart what is called top-pressure had been tried. It was more common on the Continent (for lager), but Britain was starting to use the method, too. The beer was generally filtered and carbonated at the brewery and perhaps pasteurized, what is called keg beer today. Naturally-conditioned beer was drawn either by handpull, a system originated around 1800 in England, or by compressed air dispense from tall fonts as I’ve discussed earlier. Each method delivered a different texture to the beer and different carbonation level. Each method was viewed as having pros and cons for both quality and cost. In the 1920s and even the late 1940s, it was still an open question which method would prevail. Today, the question has long since been resolved. My reading suggests 90% of all draft beer in Britain is sold by pressurized CO2 or mixed gas, the rest is by handpump for naturally-conditioned (cask) beer. Mr. Auld, like his counterpart Mr. Scott who wrote on a similar subject in 1949, was an enthusiast of compressed air dispense. Unlike Scott Auld gave a much closer look to the subject. One can summarize his opinions as follows. Compressed air produced a beer with excellent condition – good retained carbonation and freshness, even when the beer was tapped at irregular intervals, and unlike the case for handpulled beer. The compressed air forced the beer down toward the tube which fed the bar counter and did not get into the beer. Air pressure, the argument ran, does not easily dissolve in liquid but tends to form a layer. With recent improvements in air compression, Auld said different air pressure levels could be sought to suit different beer types. He stated pale ale needed pressure of c. 10 ppsi, stout 2-4 ppsi, and mild ale about 7. This sounds rather strange today, as any type of beer served on cask is viewed with favour provided it has some bubble and isn’t sour or off in some other way. In the 1920s, probably as a survival of the luxury of 19th century beer brands and types, drinkers expected different levels of carbonation for different types of beer, or at least, best practice so dictated. Auld also felt that while extra cost was involved to source the equipment needed to produce compressed air and to strengthen casks where necessary to hold the extra pressure, the cost was offset by savings in other areas of the business. He felt wastage – beer gushing outside the glass and needing to be recycled in the cask – could be minimized with properly regulated equipment. He also wrote, although stating no source, that compressed air was used in a primitive way in Scotland back in 1814. This would predate by 12 years Michael Donovan’s 1826 article I mentioned recently which advocated compressed air dispense. In fact, looking again at Donovan’s Domestic Economy volume I linked in the earlier discussion, I see he states that porter in London was dispensed by some bars using “hydraulic engines”. This may have meant that water pressure was used to create compressed air introduced in closed casks to send porter to the bar. Possibly Donovan meant the handpulls that were new anyway in the early years of the 1800s, but one would not ordinarily call them hydraulic. The discussion is here. As so often, few can claim to originate an idea, more often it results from the efforts, sometimes isolated, of numerous people. But Donovan, a respected brewing scientist, unquestionably gave an aura of respectability to compressed air dispense when his article was published in 1826. In questions taken after the presentation Auld was presented with some stiff opposition. One person said compressed air created a lot of foam and quality problems when excess fob or run-off had to be recycled into the cask. Another stated that it wasn’t true air did not dissolve in or was shielded by a CO2 layer generated by the beer. He said there was a mix of CO2 and air in the beer as a result of compressed air being injected in the barrel, and this could cause a quality problem, an unplanned fermentation. We would be more concerned about oxidation, or damp paper staling, but either way introducing air in the cask seems problematic, just as when too much air gets into a cask pulled by handpump due to slow turnover. As always, quick turnover is the key to preserving quality – for that matter, for CO2-charged beer, too. All things equal though, I support the return of tall font dispense, as argued earlier. Mr. Scott’s 1949 argument for compressed air service of beer was no more effective than James Auld’s 23 years earlier. Even in its Scottish stronghold, the tall font was retired (mostly) from serving real beer. Few if any new ones were introduced after 1960. Note re image above. 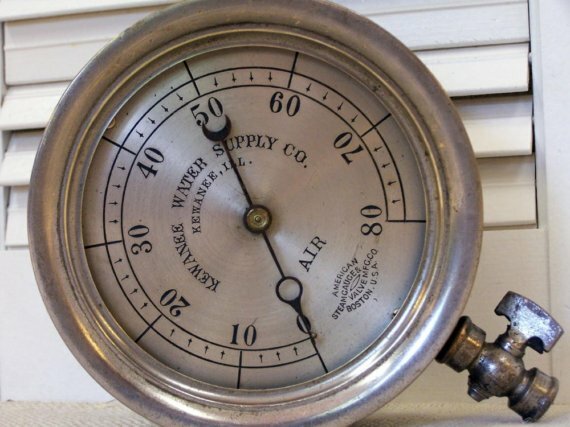 The image of an antique air pressure gauge was sourced here and is believed available for educational and historical purposes. All feedback welcomed.